Meal prep is not exactly the name of my game. The weekdays fly by for us, but the weekends fly even faster. So the thought of sacrificing a huge amount of time on even one of those days of freedom & downtime is just not something I'm typically interested in. And THAT is why I love dishes like this. If you listen to me ramble on Instagram stories, then you've probably heard me say this a time or two already: make your weekend brunch count! One of my favorite ways to multi-task and trick myself into meal prepping is to make a big ol' brunch (or even breakfast for dinner) on a Saturday or Sunday- whichever day we have to spend a little extra time hanging around the house. I make a huge brunch, and it's usually some sort of skillet or hash like this one. 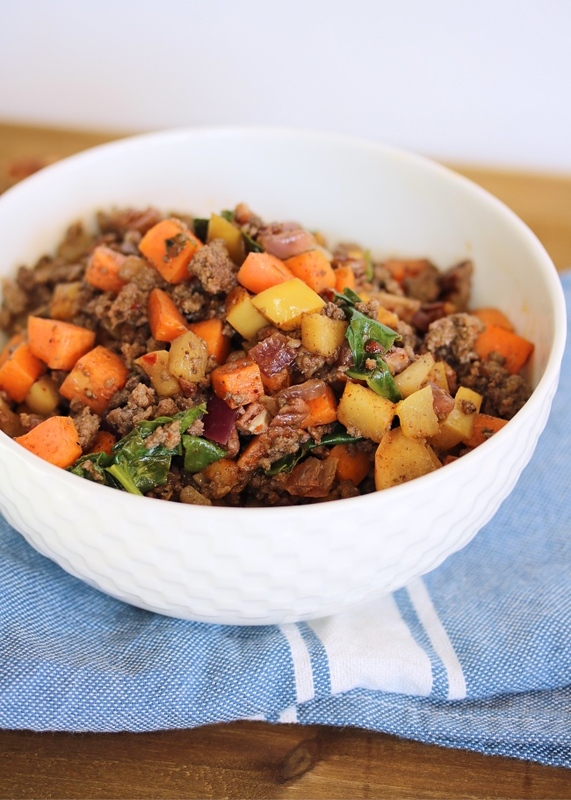 All the veggies, potatoes, ground meat or sausage (seriously, just clean out your fridge). Spice it up with some dried herbs and some garlic. It's delicious on its own if you're not an egg fan! But my favorite way to stretch it out is topping with fried eggs on the weekend (let me know if you need a recipe or how-to on those). Whatever hash is left over gets portioned out into glass containers, and reheated for breakfast the next few days. Easy peasy! So use this recipe as a guide, and feel free to sub whatever ingredients you have on hand. 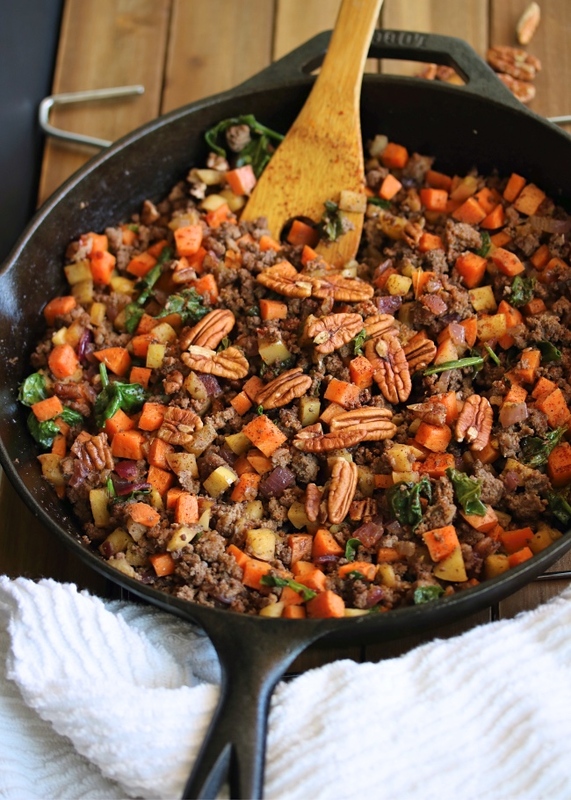 Switch up the spices, use gold potatoes instead of sweet potatoes, add bacon- whatever you like! And if you're not feeling creative: trust that this flavor combination is basically comfort food in a skillet! It's the perfect balance of sweet & savory and the ultimate breakfast flavor if you ask me. Plus, all the amazing nutrients to start your day right, with grass fed beef, apple cider vinegar, healthy fats, and even some apple & spinach! You will love! I hope you enjoy this, and find that it helps you sneak in a little of your own meal prep. 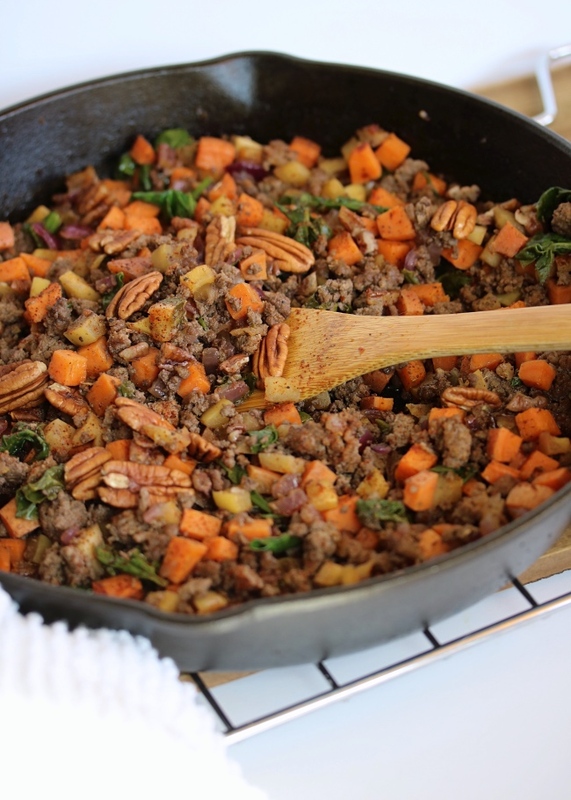 In a large skillet, heat the cooking fat over medium-high. Add the ground beef, breaking it apart with a wooden spoon and cooking for 3 to 4 minutes. 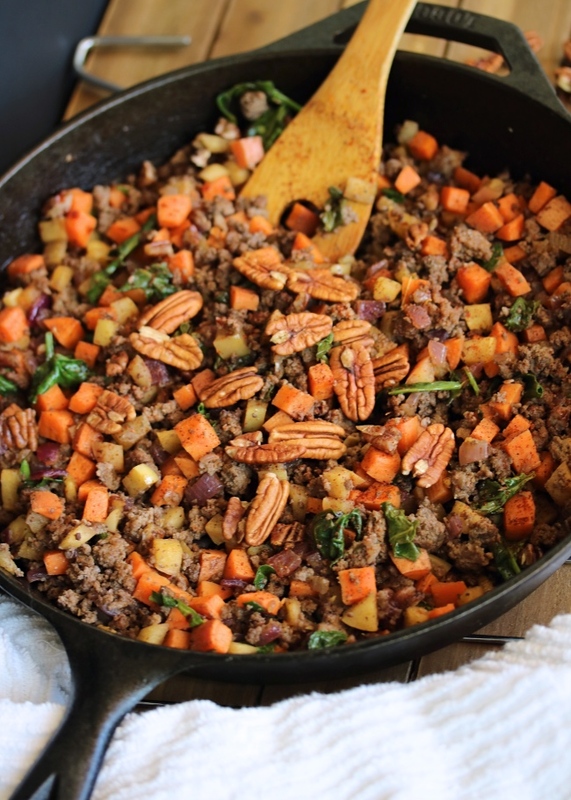 Add the onion, sweet potato, apple, pecans, and spices. 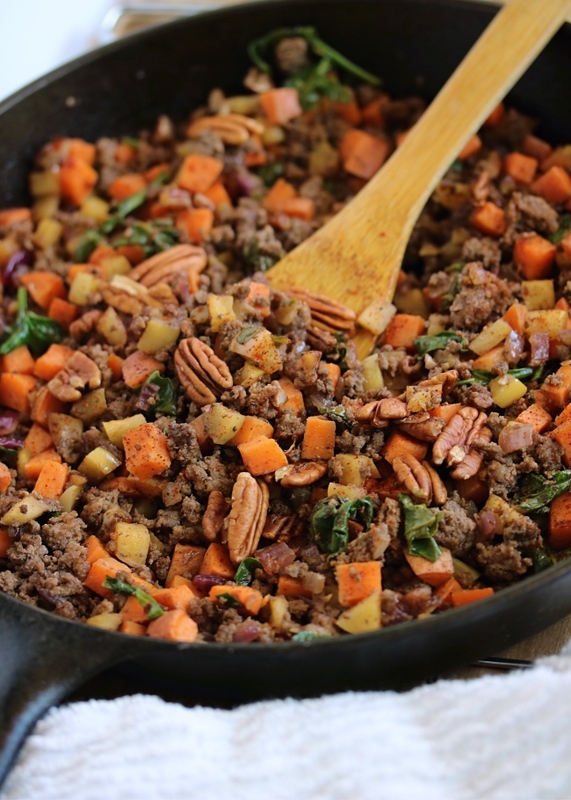 Sauté until the beef is fully cooked and sweet potatoes are tender. Pour in the juice & apple cider vinegar, and add the spinach. Stir to scrape any browned bits off the bottom of the pan. Cook until the spinach is wilted, just a few minutes. Serve hot with a fried egg on top, or all on its own! Is this whole 30 approved? I am new to this! This was great! I like that it is so flexible. I added raisons and crushed pecans and it was still delicious. You could make this a red sauce by adding some tomatoes, such a great base! Thanks! Delightful! Oh, the flavors; such a good mix! I used Whole30 approved sausage instead of beef. Thank you! This looks great! Do you think it would freeze? Hey Emily- I'm not sure about freezing, it's not something I ever do myself but I would love to know if you try it! Sounds so good! How many does this recipe serve?